The Independent: Can cash-strapped Spain afford the most-treasured jewel in its crown? Catalans pay more tax than anywhere else in Spain. 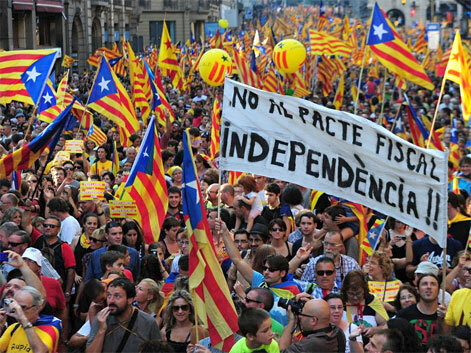 As the eurozone crisis deepens, the independence movement is gaining strength. Will this put-upon region break away? The tide is turning, Catalan filmmaker Josep Citutat tells me. “Something is changing so fast. A lot of people around me, family and friends, who weren’t independent – now they are.” Record numbers marching on the streets outside his flat in Barcelona confirm his judgment. Around 1.5 million people were thought to have filled the streets of the Catalan capital last earlier this month. Independentistes poured in from around the region, creating a sea of yellow and red up and down the famous boulevards. The strength of the protest was no surprise given the dire economic condition in the debt-addled region of a country suffering the worst of the eurozone crisis. As Europe has seen before, economic suffering is feeding nationalist sentiment. History aside, a portion of this growing antagonism has its origins in the imbalance between what Catalans contribute to central government in Madrid and what they get back in return. The idea that they are supporting the rest of Spain, which is close to collapse, breeds resentment and mirrors similar reactions in northern Europe over the eurozone crisis in general.